During the day there are normally parking spaces on the road in front of the clinic. There is also a Designated Car Port for Patients to Use, although the rest of the Springhill Car Park is for residents only. 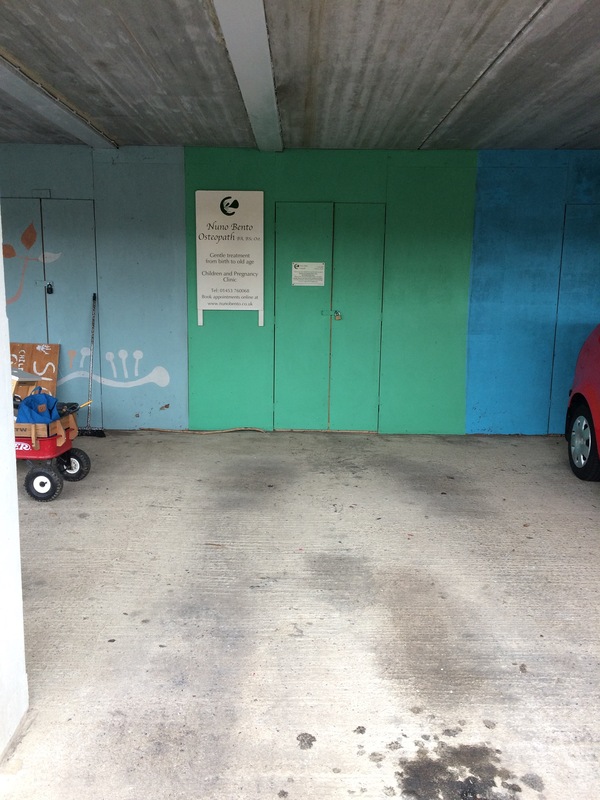 As you drive into the Springhill Car Park you will find the designated space about half way up on your left, with the clinic sign fixed to the green painted back panel of the car port . If you do park down here, you can then use the stairs on either side to get back to Springfield Road, or just follow the car park ramp up to the road (there is a small map on the back wall of the car port to help you find your way). The Thursday evening slots are the ones where parking will be more of an issue. So if you do have an appointment after 5pm and are driving to the clinic, then you may want to consider leaving your car in the Coop Shop Car Park on Slad Road (which is normally fairly quiet by that time). Alternatively you can park on Birches Drive as you come up from the Slad Road. Either way you can then walk through the park up to the topmost right hand corner, or walk up Birches Drive and take the second right turn onto Springfield Road (see Finding the Clinic).